Worries about the significance of tinnitus, which are associated with emotional distress. (Hopelessness, low mood, anger, etc). Intrusiveness, which includes reports of loudness and persistence of tinnitus and impossibility of ignoring it. To study the brief case history of tinnitus sufferers including personal tinnitus history and personal perception of tinnitus. To assess the nature as well as the psychological impact of tinnitus on tinnitus sufferers. To assess the impact of tinnitus on cognitive skills on tinnitus sufferers. Three groups were selected, comprising 10 participants each. Two groups consisted of subjects with tinnitus complaints. The first group had no hearing loss (Tinnitus group (TIG)) while the second group had mild hearing loss (PTA >25, <40 dBHL) (TWHIG), and the third group had no tinnitus or hearing loss (Normal control group (NCG)). TIG consisted of seven females and three males with a mean age of 35 years. TWHIG consisted of six females and four males with a mean age of 41.5 years. The control group comprised of five males and five females with a mean age of 36 years. Pure tone audiometry (PTA) of each subject was carried out following a standard procedure (Hudghson and Weslacke Bracketing technique). Nature of Tinnitus Questionnaire: (Stouffer JL and Tyler Richard S.)  : This questionnaire has 12 questions, and was used to determine the nature of tinnitus in terms of pitch, loudness, continuity, side of the ear, type of the sound of the tinnitus, and variables affecting the loudness of tinnitus, etc. Tinnitus Reaction Questionnaire: (Wilson, Henry, Bowen, and Haralumbus, 1991)  : The questionnaire has 26 questions, which provide information about the impact of tinnitus on tinnitus sufferers relative to distress, anxiety, and depression, etc. The Symptom Checklist (SCL-90-R): (Leonard R. Derogatis)  : This questionnaire has 90 questions, which were used to evaluate a broad range of psychological problems and symptoms of psychopathology. The test helps measure nine primary symptom dimensions (Somatization [SOM], Obsessive Compulsive [O-C], Interpersonal Sensitivity [I-S], Depression [DEP], Anxiety [ANX], Hostility [HOS], Phobic Anxiety [PHANX], Paranoid Ideation [PIDEA], and Psychoticism [PSY]). This test was designed to provide an overview of a patient's symptoms and intensity of these symptoms at a particular time. Cognitive Failure Questionnaire (CFQ):  This test has total of 25 questions, which measure cognitive difficulties. It provides two scores, a) Overall score and b) Memory score, to measure the cognitive status as well as memory problems of a person, respectively. All the questionnaires were translated and adopted to Hindi and Gujarati language using forward-backward and review translation procedure. Under this procedure, the questionnaires were first forward translated from English to Hindi/Gujarati by the native Hindi/Gujarati speakers independently who were competent in English as well. Reconciliation between the two translations was carried out. The reconciled version was back-translated by competent English speakers who knew Hindi/Gujarati as well. The forward and backward translations were reviewed to come up with final forward translation. It was then pre-tested on eight adults with tinnitus. At last, harmonized Hindi/Gujarati versions were formed by incorporating any change required. Complete history data were obtained for all tinnitus affected persons. Tinnitus was found to be present more frequently in both ears in TIG (70%) and in TWHIG (60%). Percentage of people who heard tinnitus in the right ear was less for both TIG (30%) and in TWHIG (10%). 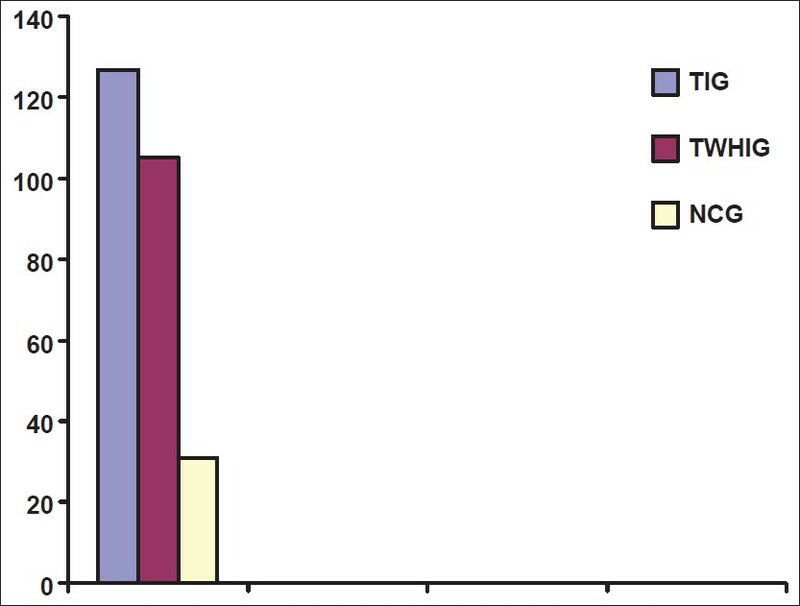 Left ear tinnitus was less common in both the groups, i.e., TIG (20%) and minimal in TWHIG (10%). Tinnitus was present more in the right ear than in the left ear, but overall for both the groups, tinnitus was reported more likely in both the ears than in an individual ear. Similar observations have been reported by RS Hallam, L Mckenna, and L Shurlock,  who found that majority of people heard tinnitus in both ears. Tinnitus was continuous for the majority (80%) of participants in both groups and intermittent for a smaller proportion of (20%) participants in both groups. Regarding loudness and pitch, similar results were found in both groups. The majority (80%) participants from each group reported that pitch was high, and the number of participants from each group reporting low-pitched tinnitus was minimal (10%). The majority of (70%) participants in each group described tinnitus as moderately loud and only 20% participants in TIG and 10% in TWHIG rated tinnitus as loud. The rest of the participants of both groups TIG (N=1) and TWHIG (N=2) reported it as low intensity. The majority of both groups, TIG (60%) and TWHIG (90%), reported that there was no change in loudness while the rest reported that there was some change. For pitch, the majority, 80% participants in each group, reported that there was no change, while 10% of TIG participants described their tinnitus as changing in pitch. The majority of TIG (50%) and TWHIG (40%) reported that tinnitus was worse in the morning while 60% of TIG and 70% of TWHIG reported that tinnitus was worse in quiet. Both groups described tinnitus as a factor, which was affecting their lives. Out of a maximum of 104 points in the 26-item tinnitus reaction questionnaire having 0-4 scale, average score obtained for both groups were high, i.e., 51.4 in TIG and 54.9 in TWHIG [Table 1]. The overall score or global score was maximum for TIG (126, SD=14.06), intermediate for TWHIG (105.16, SD=13.15), and least for NCG (31, SD=14.06). A similar study by Lynn et al,  showed that 25% of patients with tinnitus seeking audiological services showed abnormally high scores on the Symptom Checklist-90-R. as shown in [Figure 1], [Table 2]. 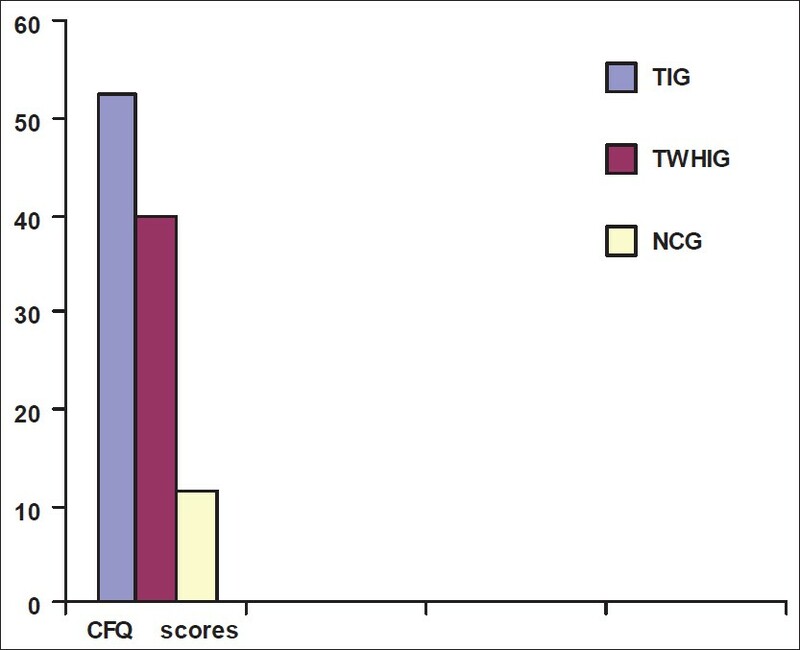 Figure 1: Comparison chart for SCL-90 global score of TIG, TWHIG, and NCG group. Cognitive failures were greatest in the TIG (52.4, SD=4.1), followed by TWHIG (39.8, SD=3.8), and least in NCG (11.4, SD=4.1). as shown in [Figure 2]. According to the analysis of self-report data, members of TIG reported more everyday "cognitive failures" on CFQ. These findings are similar to the findings of Hallam et al, who found that the mean score of TIG groups was 45.27 on CFQ with S.D. value 12.8. The present study compared the findings of people with tinnitus and people with tinnitus with mild degree of hearing loss and found the scores were similar in both groups. Our data suggests that tinnitus impairs the cognitive abilities as well as negatively affects psychological well-being of people with or without hearing loss or with a mild degree of hearing loss. This conclusion is consistent with results showing that tinnitus impairs cognitive efficiency. High scores on SCL-90 scale validate that people with self-reported severe tinnitus experience excessive stress, which affects their emotional balance and ability to cope. CFQ scores were significantly correlated with SCL-90 scores, suggesting that the tendency to report cognitive problems is part of a general tendency to give negative self-descriptions. Based on this study, the symptom Checklist-90-R does seem to be a useful tool in identifying distress among tinnitus patients. The global severity index of the symptom Checklist-90-R has a defined cutoff score indicating significant distress levels, which makes it a useful screening tool for identifying those who would benefit from psychological or psychiatric intervention. We are grateful to Civil Hospital, Ahmedabad, and District Disability Rehabilitation Centre, Ahmedabad, as they provided immense support and guidance. Our special thanks to Ms. Falguni Parmar, clinical psychologist, who assisted us in data processing, and the patients and volunteers who contributed their time. 1. Slater R, Terry M. A guide for sufferers and professionals. London: Croom Helm; 1987. 2. Henery JA, Dennins KC, Schechter MA. General review of Tinnitus: prevalence, mechanism, effects and management. J Speech Lang Hear Res 2005;48:1204-35. 3. Tyler RS, Baker LJ. Difficulties experienced by tinnitus sufferers. J Speech Hear Disord 1983;48:150-4. 4. Rothwell JC, Hallett M, Berardelli A, Eisen A, Rossini P, Paulus W. Magnetic stimulation: motor evoked potentials. The International Federation of Clinical Neurophysiology. Electroencephalogr Clin Neurophysiol Suppl 1999;52:97-103. 5. Andersson G, Eriksson J, Lundh LG, Lyttkens L. Tinnitus and cognitive functioning: a Stroop paradigm study. J Speech Hear Lang Res 2000;43:1168-73. 6. Hallam R. Manual of tinnitus Questionaire. The psychology corporation. London: Harcourt Bruce and Co.; 1996. 7. Stouffer JL, Tyler RS. Characteristics oftinnitus by tinnitus patients. J Speech Hearing Disord 1990;55:439-53. 8. Wilson PH, Henry J, Bowen M, Haralambous G. Tinnitus Reaction Questionnaire; Psychometric properties of a measure of distress with tinnitus. J Speech Hearing Res 1991;34:197-201. 9. Derogatis LR, Unger R. Corsini Encyclopedia of Psychology, Published Online on 30 th January 2010, DOI: 10.1002/9780470479216.corpsy0970. 10. Broadbent DE, Cooper PF, Fitzgerald P, Parkes KR. The Cognitive Failures Questionnaires (CFQ) and its correlates. Br J Clin Psychol 1982;21:1-16. 11. Hallam RS, McKenna L, Shurlock L. Tinnitus impairs cognitive efficiency. Int J Audiol 2004;43:218-26. 12. Lynn SG, Bauch CD, Williams DE, Beatty CW, Mellon MW, Weaver AL. 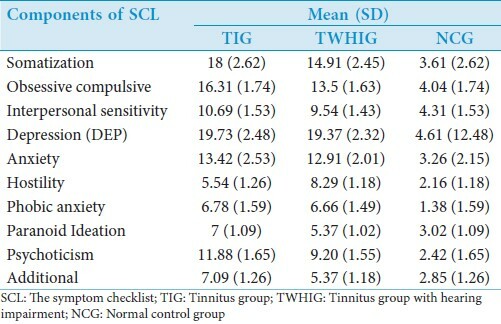 Psychologic profile of tinnitus patients using the SCL-90-R and Tinnitus Handicap Inventory. Otol Neurotol 2003;24:878-81. 1 A different view on the link between tinnitus and cognition; is there a reciprocal link?